The deal will see the Danish foundations specialist manufacturer supply more than half the TPs for the 171-turbine site. According to Dong, 56 of the TPs will be made at Bladt's UK joint venture subsidiary Offshore Structures Britain (OSB), which has a manufacturing facility in northeast England. The remaining 40 TPs of the order will be made at Bladt's Danish facility. A supplier for the other 75 TPs is yet to be announced. OSB has also received orders to supply TPs for Dong's Burbo Bank Extension and Walney Extension projects in the Irish Sea. "This order for Hornsea Project One will load the facility to full capacity for around one year and safeguard around 200 jobs in Teesside," Dong said. 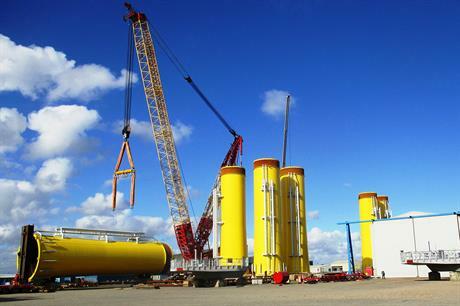 In December, Dong invested in a offshore wind tower facility in Scotland as it looks to grow its UK supply chain. UK manufacturer JDR Cables will manufacture 242km of inter-array cables for two thirds of the 1.2GW project, set to become the world's largest offshore wind site.